Rocks are composed of minerals, which are natural inorganic (nonliving) substances with specific chemical compositions and structures. A rock may consist of many crystals of one mineral or combinations of many minerals. Hundreds of different kinds of minerals make up hundreds of different kinds of rocks. Geologists, scientists who study Earth and rocks, divide rocks into three main groups: igneous rocks, sedimentary rocks, and metamorphic rocks. These distinctions are made on the basis of the types of minerals in the rock, the shapes of individual mineral grains, and the overall texture of the rock. All of these properties indicate the environment, pressure, and temperature in which the rock formed. The first rocks on Earth were igneous rocks. Igneous rocks are formed by the cooling and hardening of molten material called magma. The word igneous comes from the Latin word ignis, meaning "fire." There are two types of igneous rocks: intrusive and extrusive. Intrusive igneous rocks form within Earth's crust: the molten material rises, filling any available crevices in the crust, and eventually hardens. These rocks are not visible until Earth above them has eroded away. A good example of intrusive igneous rock is granite. Extrusive igneous rocks form when the magma pours out onto Earth's surface or erupts at Earth's surface from a volcano. Once on the surface (where it is called lava), it begins to cool and the minerals in the rock crystallize or grow together so that the individual crystals lock together. Extrusive rocks are also called volcanic rocks. Basalt, formed from hardened lava, is the most common extrusive rock. 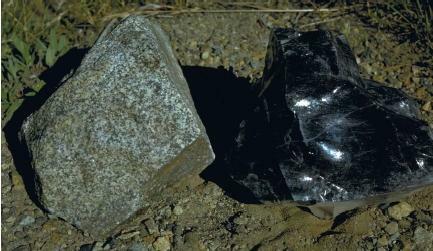 Obsidian, a black, glassy rock, is also an extrusive rock. Igneous rock: Rock formed from the cooling and hardening of magma. Lava: Molten rock that occurs at the surface of Earth, usually through volcanic eruptions. Magma: Molten rock found below the surface of Earth. Metamorphic rock: Rock formed by transformation of preexisting rock through changes in temperature and pressure. Mineral: A naturally occurring, inorganic substance with a definite chemical composition and structure. Rock cycle: Processes through which rocks change from one type to another, typically through melting, metamorphism, uplift, weathering, burial, or other processes. Weathering: Natural process that breaks down rocks and minerals at Earth's surface into simpler materials (sediment) by physical (mechanical) or chemical means. Essentially, Earth's continents are slabs of granite sitting on top of molten rock. The crustal plates of Earth are continually shifting, being torn open by faults and altered by earthquakes and volcanoes. New igneous material is continually added to the crust, while old crust falls back into Earth, sometimes deep enough to be remelted. Igneous rocks are the source of many important minerals, metals, and building materials. Sedimentary rocks are those produced by the accumulation of sediments. These may be fine rock particles or fragments, skeletons of microscopic organisms, or minerals leached from rocks. Rock fragments and leached minerals are created through weathering, a natural process that breaks down rocks and minerals at Earth's surface into simpler materials by physical (mechanical) or chemical means. broken apart by chemical processes. Acid reactions are a common form of chemical weathering, and the most common such reactions occur when carbon dioxide and sulfur dioxide in the air react with water to form weak carbonic and sulfuric acid. Both of these acids have the ability to attack many kinds of rocks, changing them into other forms. For example, when carbonic acid reacts with limestone, it produces calcium bicarbonate. The sediments created by weathering and the decay of organisms are then transported and deposited by wind, water, or ice. Over long periods of time, layer upon layer of sediments are deposited on top of each other and their own weight causes them to compress and harden into sedimentary rock. The horizontal layers of sedimentary rock are called strata. Common sedimentary rocks include shale, sandstone, and limestone. Sedimentary rocks are the only rocks in which fossils can be preserved. The elevated temperatures and pressures needed to form both igneous and metamorphic rocks destroy fossils and organic remnants. The presence of fossils and the types of fossil organisms in a rock provide clues about the environment and age of sedimentary rocks. For example, fish fossils in sedimentary rock indicate that the sediments that make up the rock were deposited in a lake, river, or marine environment. By establishing the environment of the fossils in a rock, scientists learn more about the conditions under which the rock formed. Metamorphic rock is rock that has changed from one type of rock into another. The word metamorphic comes from Greek and means "of changing form." Metamorphic rock is produced from igneous, sedimentary, or even other metamorphic rocks. Most of Earth's crust is made up of metamorphic rock. Igneous and sedimentary rocks become metamorphic rock as a result of intense heat from magma and pressure from burial within Earth. Although the rock undergoes extreme heat and a great deal of pressure, it does not melt. If the rock melted, it would become igneous and not metamorphic rock. Instead, the heat and pressure combine to change the mineral makeup of the rock. Essentially, metamorphic rocks are made of the same minerals as the original rock, but the various minerals have been rearranged to make a new rock. There are two basic types of metamorphic rock: regional and thermal. Regional metamorphic rock, found mainly in mountainous regions, is formed by pressure. 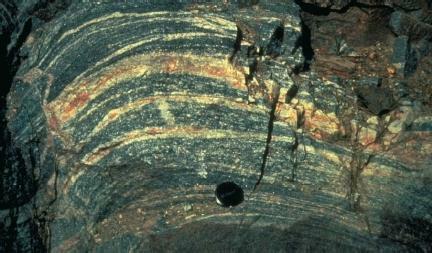 Different amounts of pressure produce different types of rock. The greater the pressure, the more drastic the change (also, the deeper the rock the higher the temperature, which adds to the potential for diverse changes). For example, a pile of mud can turn into shale (a fine-grained sedimentary rock) with relatively low pressure, about 3 miles (5 kilometers) down into Earth. With more pressure and some heat, shale can transform into slate and mica. Carried even deeper, slate transforms into schist (pronounced shist) and then gneiss (pronounced nice). Thermal metamorphic rock, also called contact metamorphic rock, is formed by considerable pressure and, more important, intense heat. When molten rock pushes up into Earth's crust, the incredible pressure behind it forces the molten rock into any empty space. The accompanying intense heat causes the surrounding rock to completely recrystallize, forming a new rock. An example of this type of thermal metamorphic rock is marble, which is actually limestone whose calcite has recrystallized. Sandstone made mostly of quartz fragments recrystallizes into quartzite. Thermal metamorphic rocks are not as common or plentiful as regional metamorphic rocks. The rock cycle depicts how the three main rock types can change from one type to another. All rocks exposed at Earth's surface undergo weathering, forming sediments that can be deposited to form sedimentary rocks. 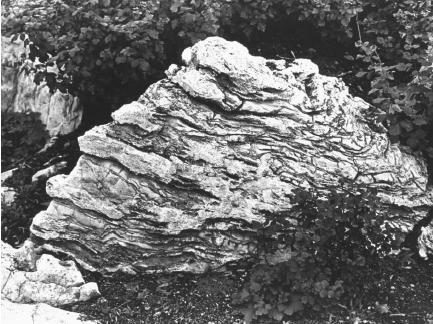 As sedimentary rocks are buried beneath more sediment, they are subjected to increases in both pressure and temperature, which can result in metamorphism and the formation of metamorphic rock. If the temperature of metamorphism is extremely high, the rock might melt completely and later recrystallize as an igneous rock. Rocks can move through the rock cycle along other paths, but uplift or burial, weathering, and changes in temperature and pressure are the primary causes of changes in rocks from one type to another. We think that your website thingy is OK because it provides an exellent deal of information but you should provide more specific information on igneous, metamorphic and sedimentary rock formations and what these words mean. I loved your website about all of these rocks!!! I found a lot of information i needed to know on how the rocks change into other rocks for my science report!!!! THANK YOU SO MUCH FOR MAKING THIS WEBSITE!!!! Yo, thanks for making this dude(s) Really helpful. I got an A+ because of you guys. Thanks. this website is good for info but needs to say how they are useful and some types of that rock but otherwise ok.
thanks so much for the information it was very helpful for my reprot i really apreciate it !!!!!!!!!!!thanks!!!!!!!!!!!!! I REALLY LOVE TO READ YOUR ARTICLE ABOUT ROCKS. I LEARNED SO MUCH ABOUT ROCKS, AND IT CAN HELP ME IN MY SCIENCE LESSONS AND MY SCIENCE REPORT. I REALLY THANKED YOU FOR THIS ARTICLE. I LOVED IT VERY MUCH. wow, thank you, i have been looking for this information for a while. this really helped me with my sience project!!!!!! thanxz this site really helped me wit my homework!!!!!!! thanz for the infos + site, it really helped me wit my homework!! i love this informations. Because it really helped me... THANK YOU. I loved this site, it got me and A* on my science project about rocks and weathering! It is truly amazing! Thanks much for introducing this kind of information materials,it has helped me to solve some questions relating rocks. Thanks in advance. Thanks sooosooo much I have a project due tomorrow and your site helped make it the very best!! i need more i need what types are in the igneoius rock and same with sedimentary and metamorphic!!! i no all i need to o about the types of rocks, but i just need it to go deeper!!! if you can do that great, but if not well then ill just be at a different website!!! this info has really helped me with our dep study!!! I LOVE YOUR WEBSITE.I SEE THE ANSWER TO MY ASSIGNMENT/HOMEWORK,AND I ALSO LEARN ABOUT THE DIFFERENT KIND OF ROCKS,THEIR MEANING AND THEIR TYPES.AGAIN THANKS A LOT. Good site, I love it!! More info please! i loved this website.i had some homework and i forgot my science notes. this web site really helped me!! this informs with pictures gives a detailed account on rocks. what a nice website its helps a lot, keep up the good site. pumice is also a igneaus rock which is formed by the air traps in lava.coal is a sedementry rock.taj mahal is made from sandstone.Limestone contains calcite mineral.Gniss rock shows alternative pattern. YAY! thanks for the help, I think I'll ace my test today! i lovve this website i got an A+ in my projet and it has pictures of sedimentary, igneous but not metamorphic I LOVE THIS WEBSITE!!! This site was a big help has all thw imfo i needed! wow i love this site i didn't find every thing but i found some things. that's good info.! i need that for my science project! if sedimentary rocks change to igneous rocks what do you call that? um i have a quiz tomarrow and i want to know some more information thank you bye. Can you explaine what all three of those rocks have in common? This was very helpful and I thank you for helping me. Thanks..I've got a lot of usefull information for my geoloy assignment. OH MY GOD..THANK U VERY MUCH ..I LEARNED MORE INFORMATIONS ABOUT ROCK..
OMG THANK YOU SO MUCH!!! THANKS ALL FLR YOUR HELP I GOT AN A+!